Ever since my step-mum Sue took me for an ice cream soda in the restaurant at Peter Jones in London’s Sloane Square, I’ve been in love with this heavenly combination of fizzy pop (soda), ice cream and syrup. 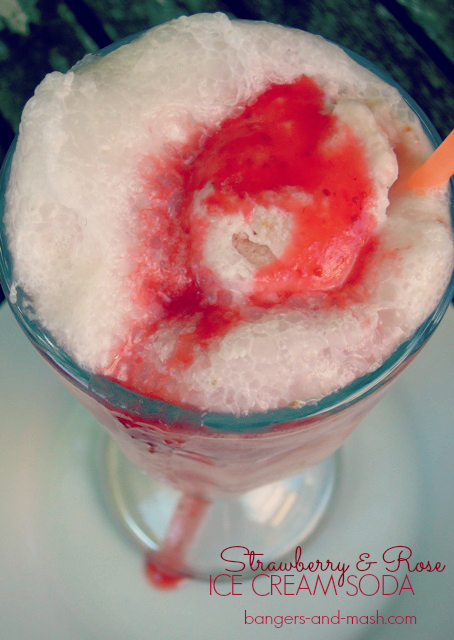 Something simply magical happens when the ice cream hits the fizz and I am instantly transported to seventh heaven. Throw in some of my current favourite ingredient, rose water, and wow – I am in ecstasy. 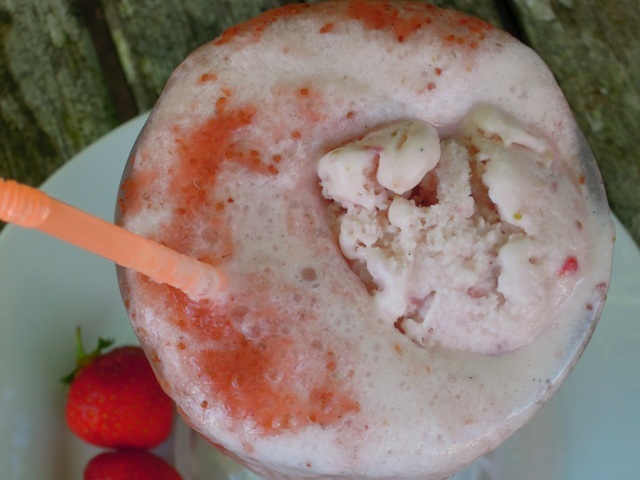 I have fantasies of one day opening my very own retro soda fountain with mini juke boxes on the counter playing Chantilly Lace and True Love Ways, and this Strawberry & Rose Ice Cream Soda will definitely be featuring on the menu. It’s every so easy to make. I did use homemade strawberry ice cream (from a Ben & Jerry’s recipe), with gorgeous chunks of juicy strawberries, but of course you can always use shop-bought. But do please make your own strawberry and rose syrup. 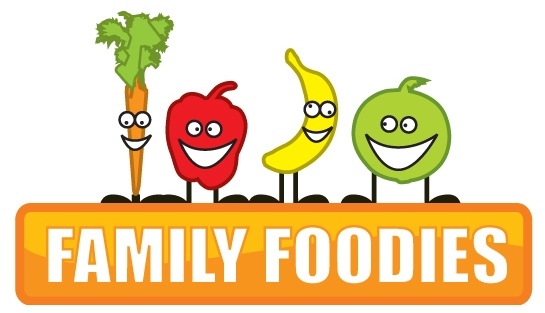 It takes hardly anytime at all and tastes incredible. Mix together the chopped strawberries, 100g of the caster sugar and lemon juice in a bowl. Cover and refrigerate for an hour. Whisk the eggs in a large bowl until light and fluffy. Whisk in the remaining 230g of sugar, a little at a time, then continue whisking until completely blended. Pour in the cream and milk and whisk until thoroughly combined. Take the strawberries from the fridge and mash to create a chunky puree. Stir this into the egg/cream mixture. Transfer the mixture to an ice cream maker and freeze following the manufacturer’s instructions. Alternatively, transfer to a plastic container and place in the freezer for around four hours, remembering to give it a good stir every hour to break up any ice crystals that are forming. 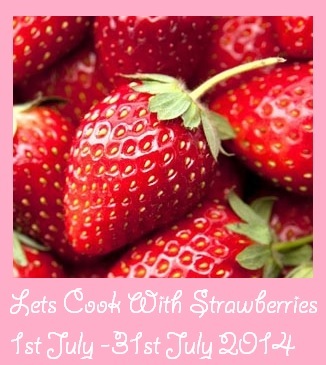 Place all the ingredients in a medium saucepan and simmer gently for around 5 minutes until the strawberries are soft and the sugar has melted. Puree with a hand blender. If you like you can strain the puree through a fine-meshed sieve to remove the seeds. I must admit, I couldn’t be bothered with this stage. Pour a little strawberry and rose syrup into a tall glass. Add a couple of scoops of strawberry ice cream to the glass, followed by cold lemonade. I love the way it froths up at this point! Drizzle with a little more syrup to finish. Armed with a straw and a long spoon, you’re good to go. Enjoy! 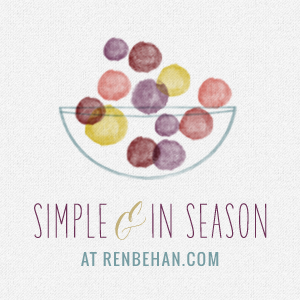 I am entering my Strawberry & Rose ice cream sodas into the following blog events: Let’s Cook With Strawberries (hosted by Simply Sensational Food); Family Foodies (hosted by Bangers & Mash and Eat Your Veg); and Simple and in Season (hosted by My Custard Pie and Ren Behan). Hurry up summer I want to try this! Ha! You’ve just made me all nostalgic! 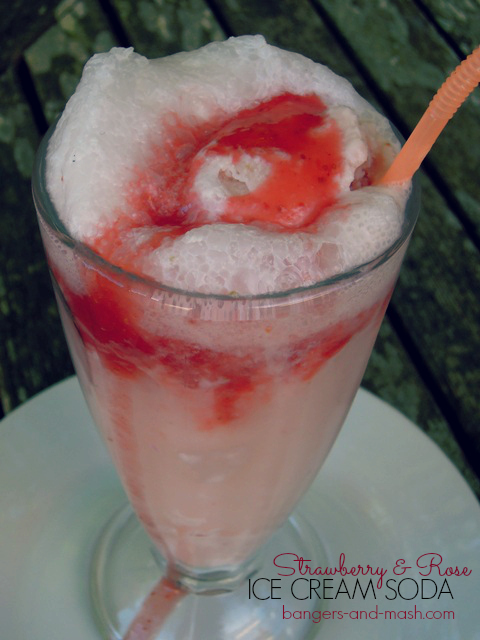 It’s years since I had an ice cream soda….. MUST try this!!! It is such a nostalgic drink isn’t it? A great way to relive your childhood! Very partial to something with rose flavour – especially given where I live. This cordial could be so versatile.